Click and drag the handles to define the part you want to crop to. Fine tune your selection using your keyboard's arrow keys or input boxes above. When you are ready, press Crop! 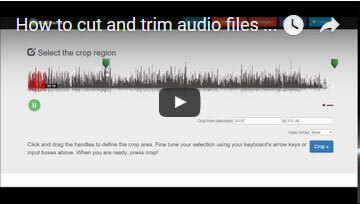 Audio Trimmer is a simple online tool which lets you trim your audio files on the fly. Choose your file and click Upload to get started! Thanks for using Audio Trimmer! Trim mp3 tracks and other audio files online without installing complex software on your device. Do you want to crop that certain part out of your favourite song? Perhaps you would like to remove unwanted sections of your audio recordings? If so, this free online audio cutter is all you need! If you are looking for a full featured audio editor, you can try Audacity, which is an open source downloadable software. Designed to work on most modern devices including tablets and mobile phones. Cut songs and audio records directly on your mobile device's browser. No need to install third party apps or programs! How to cut mp3 files online? Choose an mp3 or any other audio file from your local hard drive. That's all! Now you can download your trimmed audio file. Browse your device and choose an audio track. Drag the handles to select the part you would like to use as your ring tone. Select Fade in, Fade out or Both if you want to apply fade effects. Choose m4r format for iPhone, or keep the original audio format for other devices. Press Crop and download your ring tone!